Eagles quarterbacks Carson Wentz and Chase Daniel are both safe. The 2016 Philadelphia Eagles season is essentially over, so with three games remaining, we'll start to look ahead to the offseason. As a starting point, let's take a look at each position and figure out which players will be back in 2017, beginning with the quarterbacks. He played behind an offensive line that was shuffled for most of the season. He threw to perhaps the worst receiving corps in the NFL. He consistently had big plays eradicated because of mental errors or drops. He (mostly) lacked a quality rushing attack. Still, Wentz often put the team on his back and kept the Eagles in games. Wentz has shown a strong arm, physical toughness, leadership qualities, mobility, good pocket presence, and the ability to read defenses. That's an outstanding start for any rookie, much less one coming from an FCS school. Going forward, Wentz will have to work on his accuracy and his mechanics, which probably go hand in hand. He'll also have to cut out some of the poor decisions, which were understandable considering he's likely to finish the season with the second-most pass attempts of any rookie in NFL history. Clearly, though, the Eagles have their franchise quarterback, and a major piece to build around for the future. Carson Wentz: Stay or go? Last offseason, Daniel signed a three-year, $21 million deal to be the backup to Sam Bradford. When the Eagles traded Bradford, Wentz leap-frogged Daniel into the starting role. Above, we noted Wentz's toughness. With three games to play during the 2016 season, Wentz has taken every single snap this season for the Eagles, which means that Daniel has not yet gotten to play. The only glimpse that Eagles fans have gotten of Daniel was during the preseason, when he was (we'll be kind) shaky. Daniel is Doug Pederson's guy. 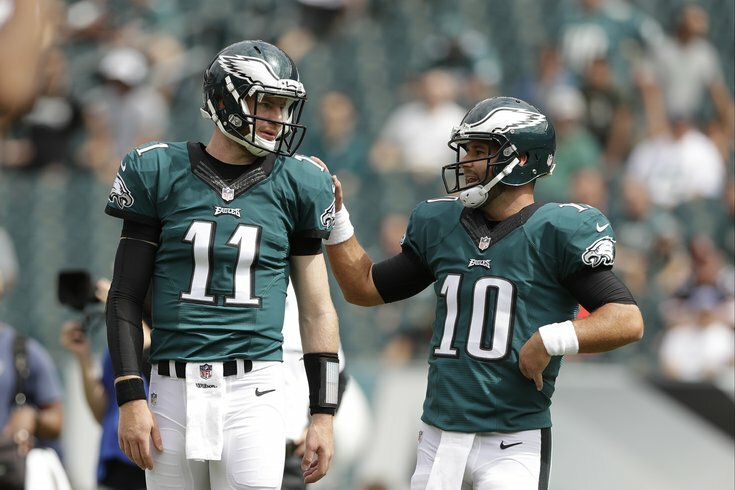 The Eagles made the signing of Daniel last offseason a priority, and Pederson has noted that Daniel has been a second set of eyes on the field and in the quarterback room for Wentz his rookie season. #JimmyVerdict: Daniel isn't going anywhere.